Moorish dome and tower of lodge. Hundreds of wineries are found in San Luis Obispo County promising no shortage of tasting and discussion. My friends and I exited north from Highway 46 onto Vineyard Road for a sampling of local vintners, including delicious sips at Denner, Chateau Margene, Opolo and Halter Ranch where we picnicked on their patio (they kindly lent us wine glasses). The drive itself is beautiful among the old oaks and quiet lanes. 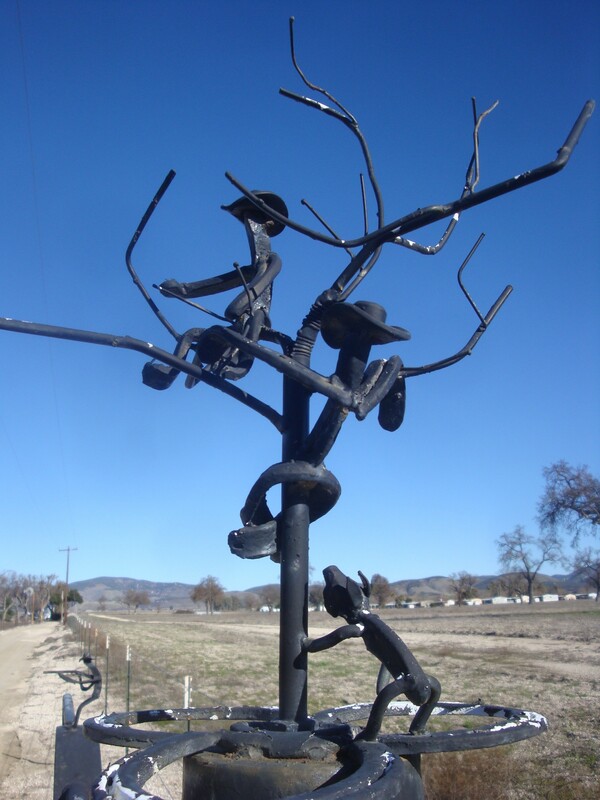 Rather than the busy, over-exposed Highway 46W wineries, driving the loop of Vineyard to Adelaida or Peach Canyon roads is a refreshing excursion. But out final destination was beyond the lake areas of Nacimiento and San Antonio to the National Historic Hacienda Lodge on Fort Hunter Liggett. 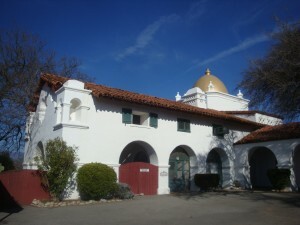 William Randolph Hearst’s Piedmont Land and Cattle Company acquired over 160,000 acres of land throughout the 1920s before adding the entire 43,000+-acre Rancho Milpitas in 1925. 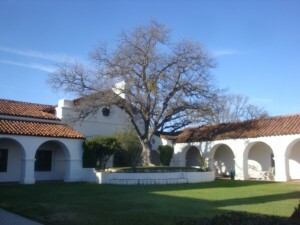 The Hacienda was built in 1929 as a guest house/hunting lodge for Hearst and his guests. 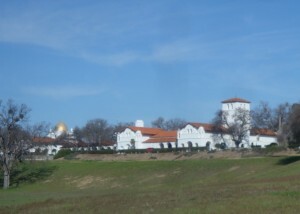 Designed by his castle architect Julia Morgan, it is a large Spanish Colonial Revival building meant to compliment the nearby Mission San Antonio. His Hacienda was probably used as a getaway for the famous as Hearst generally did not want his animals shot! Such friends as Error Flynn, Clark Gable and Will Rogers frequented its rooms and public halls. In 1940, Hearst sold 160,000 acres to the government and the Hacienda now is on the very active Fort Hunter Liggett military base. The area can keep you busy for 2-3 days. 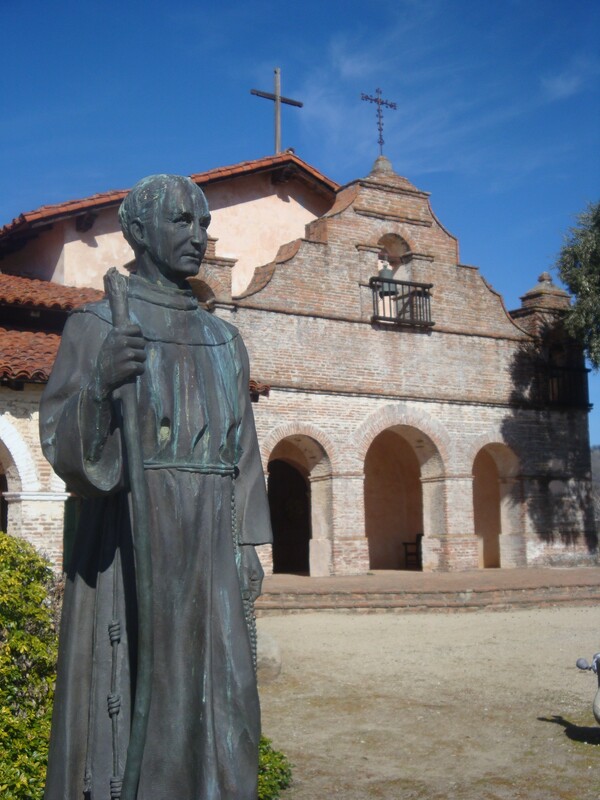 Visit the completely restored 1771 Mission San Antonio De Padua (Hearst Corporation financed its full restoration); browse the local store and restaurant in Jolon; watch for Bald Eagles who call Lake San Antonio home; be alert for the sights and sounds of military maneuvers as our servicemen receive final training here before being shipped overseas. Plan taking steaks to BBQ (grill in back near the pool). Although there is a simple breakfast served, there are no dining facilities at this time. A restaurant is planned to open in 2011 but check first and it will save you from dining out of the PX (even the bowling alley was closed when we were visiting). Also, there is NO gas available on base (unless you have military ID) so plan ahead. The lodge is government property and arriving at the military base, everyone will be required to present ID or driver’s license, auto insurance and registration. Your gentleman host, Doug, will show you around. Don’t miss the beautiful murals in the dining hall and bar area. There are currently 6 suites, 5 Cowboy rooms with an excellent common bath down the hall (can’t imagine Clark Gable using the toilet down the hall), and a possibility of additional rooms in the future. The Hacienda is a quiet place, unless there are military maneuvers. Contact “Hacienda Lodge” hacienda_reservations@yahoo.com. Telephone is 831-386-2262. The three of us had a wonderful Tower room with private bath for $90. In our room were a refrigerator, coffee, flat screen TV, movies and DVD. The California State Military Department has a good web page covering the history of the area and sites if interest. 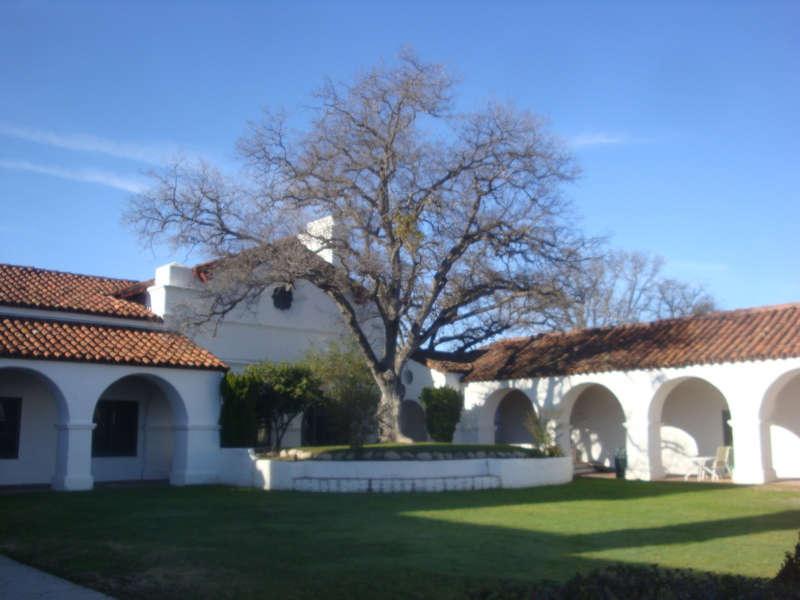 You can also lodge at Mission San Antonio De Padua, which has very basic rooms available for retreat. A one-day overnight retreat is $75 pp. double occupancy (includes lunch, dinner, breakfast). Contact them at 831-385-4478 or office@missionsanantonio.net for room rates, availability, and a schedule of festival dates. To Google your route, look for the small town of Jolon, CA. There is an easy route west from Highway 101 in King City or if coming from the south, west from Bradley. Or drive the back route through Paso Robles north via Nacimiento Lake Drive/G14 staying left on Interlake Rd/G14 then left onto Co Rd G14/Jolon Rd. Mission Road goes directly into Fort Hunter Liggett. For those wishing a challenge, in season, there is a partially paved Nacimiento-Fergusson Rd. road off Highway 1 near Kirk Creek Campground north of Ragged Point. But it is seasonal and don’t attempt it without knowing its condition beforehand.